Static wall-mounted graphics can only go so far. 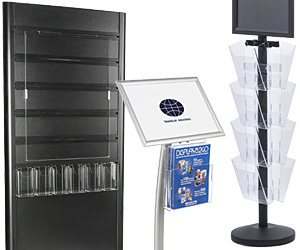 Instead, why not place one of our poster display stands out in front for maximum exposure? This supplemental advertising technique helps retailers point targeted content to customers. Since these floor displays can be placed strategically, the odds of garnering the attention of passersby is therefore increased. 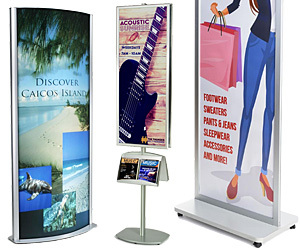 Both durable and affordable, commercial poster display stands come in many styles for the discerning business owner. 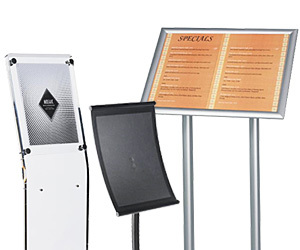 Browse our extensive selection of retail sign holders, available in all the standard graphics sizes. 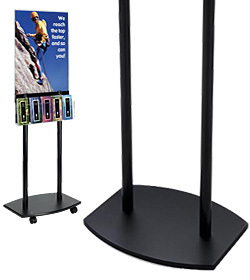 Use poster display stands for trade shows, store entrances, waiting rooms, mallways — the applications are endless. From big to small, our offerings take mobile advertising to new heights! 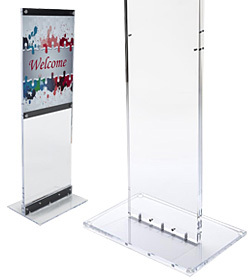 What styles of poster display stands are available? Small pedestal signs are great choices for lobbies and entrances. Popular sizes are 8.5" x 11" and 11" x 17". 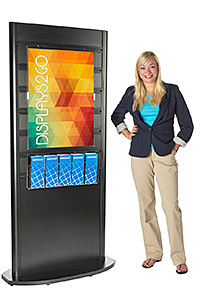 Larger displays (22" x 28" and 24" x 36") offer greater real estate for enticing customers with colorful graphics. Models are available in single or double-sided versions. Snap-open frames are some of our best selling products. 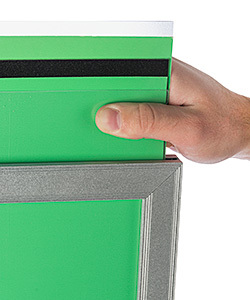 Each of the four sides flip open for quick and easy front-loading access. Some models feature slots located at the top or side of the frame. 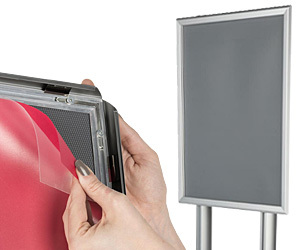 Posters simply slide through the slot and into the display. A third style is the faceplate. Manufactured from clear acrylic plastic, these thick plates feature machine-polished edges. 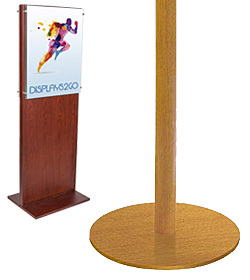 They are affixed to stands with decorative screw caps in fancy metallic finishes. 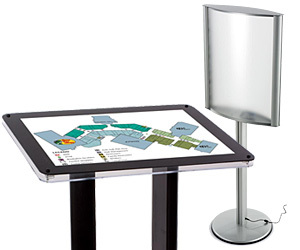 Stands with brochure holders further enhance the effectiveness of any advertising campaign. Promote your merchandise or services while offering takeaway literature. 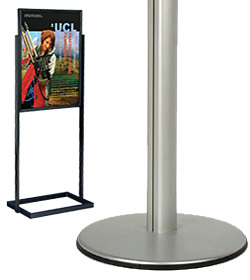 Financial institutions are one example of an industry that actively uses these commercial poster stands. 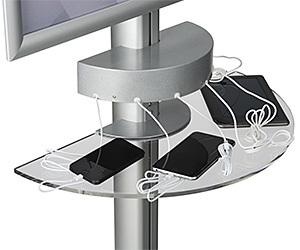 Our charging stations line lets patrons boost their device's battery, courtesy of you (the business owner). By offering this free service, it can attract potential customers into your store. 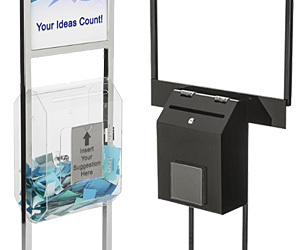 Ballot boxes are another great accessory for marketing. Hold prize drawings, collect suggestions, or raise funds while promoting the event with full-color graphics! Illuminated signs push the advertising impact a step further. Whether lit with LEDs or fluorescent bulbs, these models provide extra special emphasis. 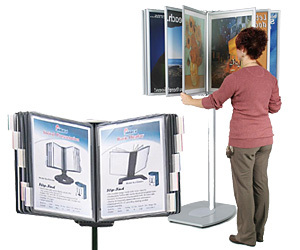 We sell a number of directory stands with slightly angled surfaces. They make excellent tools for directing visitors in shopping malls and business offices. Poster totems showcase large format graphics rising more than six feet tall. Many feature contemporary curved designs. 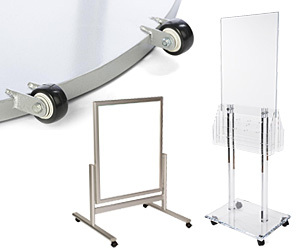 Mobile poster stands feature rolling casters. Lots of retailers located inside malls like to wheel an advertising floor stand out into the "mallway" to attract customers. Utilizing base casters makes this effort easy and convenient. When it's time to close, simply wheel it back inside before locking up. Exterior-rated sidewalk signs make up a large portion of our inventory. Styles include A-frame designs, sandwich boards, chalkboards, and changeable letterboards. Outdoor sidewalk signs attract potential customers either on foot or off the street — rain or shine! 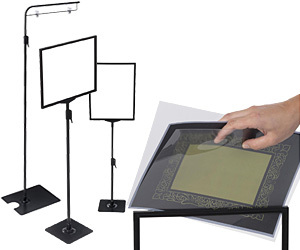 Sign stands are manufactured from many different materials. Steel and aluminum framing is the most common. These materials provide the best results for durability and longevity. The metal displays also offer the most in terms of selection. Plastic styles are available in clear or black. We use very thick clear acrylic posts with polished edges which provides the most professional results. 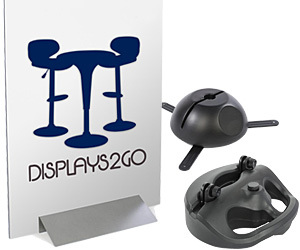 The black models are constructed from ABS plastic, and are equally impressive appearance-wise to the clear stands. Wooden displays are the traditional choice thanks to their warm cherry, oak, maple, and mahogany veneers. They make great choices for stately interiors and upscale environments. 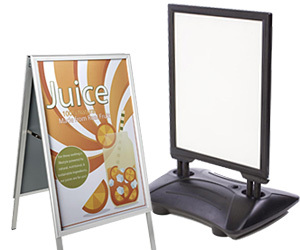 If you are looking to increase revenue, displaying a poster that promotes a new service, product, seasonal sale, special event or any other promotional campaign is essential. Another way to elevate the effectiveness of your advertising is to follow through with consistent design and planning. Poster frames for walls extend your marketing reach when paired with their floorstanding cousins. Let our substantial selection help point the way!